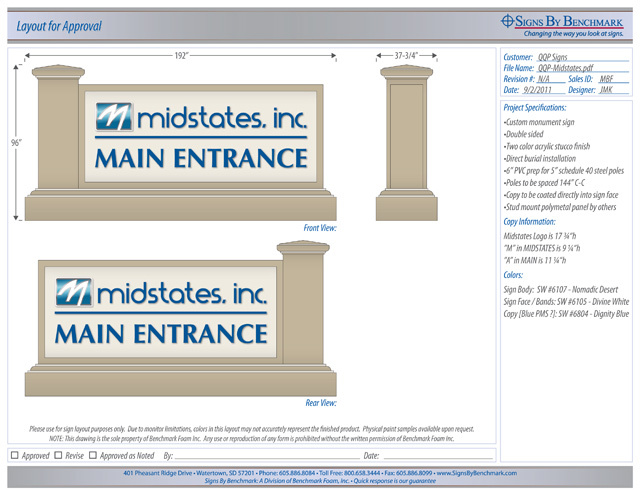 In collaboration with QQP Signs, the Signs By Benchmark team is currently working on a 16′ wide x 8′ high x 37 3/4″ deep custom monument sign that will be sure to draw attention as wayfinding signage. 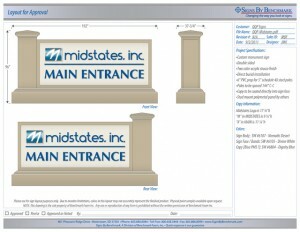 Featuring copy coated directly into the sign face and a two-color acrylic stucco finish, this double-sided sign will have no trouble standing out from the crowd – not just due to sheer size, but also to its modern, architecturally pleasing presence as it points the way to the main entrance of Midstates, Inc., Aberdeen, South Dakota. The Signs By Benchmark team creates a wide range of exterior and interior signage and sign accents such as bases, pole covers and sign tops. Working with cellular plastic allows the team to manufacture unique designs that aren’t easily achieved through the use of traditional materials. 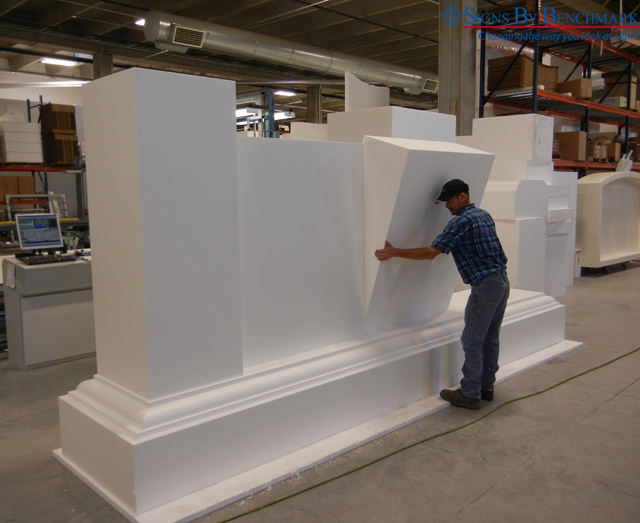 Signs By Benchmark molds its own cellular plastic (EPS expanded polystyrene) on site, then creates products through a combination of CNC-cut and hand-sculpted processes according to design needs. Over a decade of experience has provided the Signs By Benchmark team with the expertise needed to turn their customer’s sign ideas into reality. Their true niche has become custom signage creation, but they also provide a line of standard signs that can be altered to suit the end customer’s needs. All Signs By Benchmark products are assembled, then sealed with its signature hardcoat that provides a seamless, durable finish that withstands extreme weather conditions. To read how a Signs By Benchmark sign withstood 115mph winds, click here. Give the Signs By Benchmark team a call today at 800-658-3444 to discuss your next sign project!